Brazilian waxes, Brazilian bikinis, Gisele Bündchen – there's a lot that's beautiful about the South American country. And proving it's a trendsetter yet again, Brazil's national soccer team has pimped out its plane for the World Cup to match the beautiful game it produces on the field. 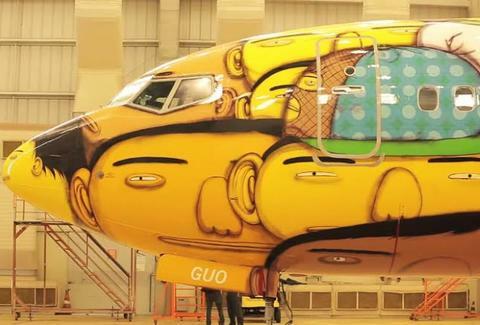 Brazil’s hottest art collective, Os Gemeos comprises identical twins Octavio and Gustavo Pandolfo, former break-dancers now known for their graffiti and signature yellow cartoon characters. According to Artnet.com, the duo, who’ve already tagged trains and buildings, dreamt of painting a plane; upon hearing this, Brazilian airline GOL reached out to them about gussying one up in honor of the World Cup. The twins were then tasked with having the work represent “Brazilianness, democracy, and diversity”, and are said to have used more than 1,200 cans of spray paint -- which, for some reason, were imported from Spain -- in the week it took to complete the airborne mural. The graffitied Boeing 737 will fly the team from city to city during the FIFA World Cup, which kicks off June 12. Check out the making-of video below. Sophie-Claire Hoeller is Thrillist's über-efficient German associate travel editor, and you can guess which team she'd support, if she was into that sort of thing. Follow her @Sohostyle.